Pincushions Currently being offered only during a limited number of my occasional Pop-Up Shops. Also notify me when new reproduction Izannah Walker dolls are available. These are adaptations of decorative pincushions given as presents to new parents upon the birth of their children. The present was actually the straight pins, which were quite costly and used for fastening clothing, even diapers. The decorative aspect of the pincushion was simply a very pleasing way of presenting the pins. Scraps of silk, lace and trims left over from dress making were used to fashion the pincushions. I hand sew each pincushion, which has a lining of 100% cotton canvas, and is stuffed with sawdust. I use modern pins. Reproduction pins are available, but sell for $2 each. If I were to use reproduction pins, the price of the finished pincushions would be prohibitive. 100% silk cover trimmed in woven metal braid (trim may vary from that pictured). The lettering and designs are comprised of over 1000 straight pins. Approximate Shipping Time: Currently being offered only during a limited number of my occasional Pop-Up Shops. 100% silk cover, antique lace (lace will vary). The designs and lettering are worked in approximately 900 straight pins. The double “ll” in “wellcome” is intentional, as it was in the original upon which this is based. You may custom order pincushions with your choice of names, dates and initials. Base price for a custom pincushion is $205. There may be additional charges if your design is very complex. This clamp on pincushion also functions as a sewing bird or “third hand”. It is made of distressed cotton muslin and mounted on a cast iron clamp. 9 ½ inches tall plus the clamp. 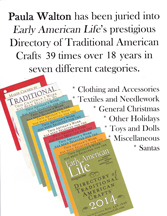 As pictured on page 81 in the August 2008 issue of Early American Life magazine. Approximately 9-1/4 inches tall. This is an original design of mine that incorporates both the traditional craft of rug hooking and 19th century make-do pincushions. The strawberry is hooked onto burlap, using wool that I dye by hand. The wool for the leaves is also hand dyed and is cut using a pinking machine. The hooked strawberry sections are sewn together by hand. The pincushion is filled with organic cotton stuffing and mounted on a glass candlestick. Candlesticks may vary slightly in appearance and height from the one pictured. I do not sell a pattern for this strawberry – it is only available as a finished pincushion. $129 on candlestick base or $127 without base. Based on traditional make-do pincushions and an antique emery in my personal collection. Made of hand dyed wool with organic cotton stuffing, hand-dyed wool leaves and real emery. Mounted on a glass candlestick or on an iron clamp as use as a third hand (see item D in photo following). Comes with one emery for $49 or with four emeries for $89. Made of hand dyed wool, with pinked, hand dyed wool leaves. The large strawberry pincushions are filled with organic cotton stuffing and the small strawberries are filled with ground emery (used to sharpen pins and needles). Pincushions available mounted on a glass candlestick or on an iron clamp for use as a third hand. Candlesticks may vary slightly from those pictured, both in appearance and height.